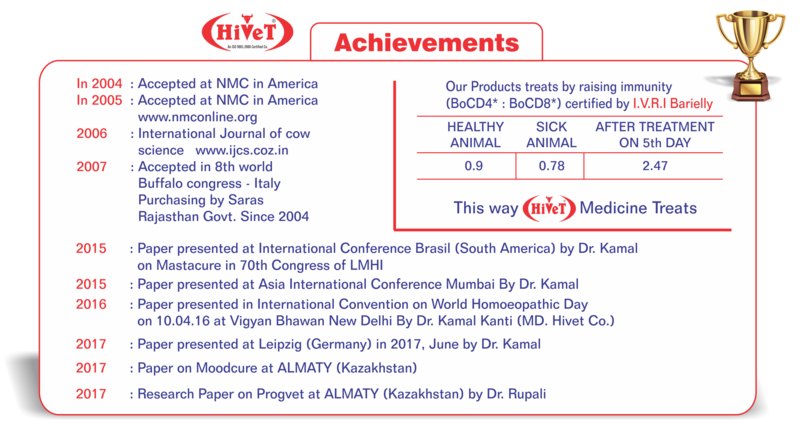 Hivet is Homoeopathic Veterinary Company by now has launched 24 products in the Market by name Mastacure -for Mastitis, Uterocure -for Uterine ailments, Millure -for increasing quality & quantity of Milk, Urikur -for Urine problems, Digivet -for Indigestion, Progvet -for Repeaters, Lapcure -for Prolapse of Uterus, Moodcure -for Getting full quantity of milk at right time, Calfcure -for All diseases of Calfs, Diarcure – for Diarrhoea, dysentary & Coccidiosis, Skincure – for All types of Skin Diseases, Fmd Vet – for Foot & Mouth diseases, Tailcure - for Gangrene/ necrosis of tail or any other part of the cattle, Fibrocure - for fibrosed tissue of udder or teats or anywhere in cattle, Heatstroke - In summer for heatstroke for excessive heat of the body, Actinovet - For Tumours, Lumps, actino mycosis, goiter. Mastahivet Gold Kit - Complete treatment for mastitis, Hivet’s Repeater Kit - complete treatment for repeater, Hivet’s Summer Relax kit - Complete treatment for Summers, Hivet’s Moodcure kit - Complete treatment for milking at right time. Hivet’s septicure - for sepsis any & everywhere, Hivet’s fevercure - for fever of all types, Hivet’s poultry grow- for growth of chicks, Hivet’s Ranikhet cure - for Respiratory problems of chicks. 1. Mastacure™ was found highly effective in treating clinical cases of mastitis in cows and buffaloes. The clinical and bacteriological cure rate was highest in acute form (84.00%) followed by sub-acute (64.76%) and chronic (50.59%) forms of clinical mastitis. 2. Mastacure™ was highly cost effective when more than one quarter was involved. 3. A high percentage (80-84) of different teat affections including blood in milk, teat stenosis, improper let down of milk and teat obstruction were successfully treated with oral administration of Mastacure™. However, therapeutic response in cases of teat fibrosis and teat atrophy was found to be 50 percent only. 4. In sub-clinical mastitis in cows, the bacteriological cure in Mastacure™ treated quarters was found to be 66.67% on day 20 post-treatment, whereas in sub-clinical mastitis in buffaloes the bacteriological cure rate was as recorded as 77.77% on the day 20 post-treatment. 5. No side effects of Mastacure™ were observed during the course of treatment in cases of mastitis. “Mastacure gave encouraging results in treating cases of blood in milk, teat stenosis, teat obstruction, milk let down problems and sub acute streptococcal mastitis. The drug is economical when more than one quarter of animal is affected�?. And then we have got Trial from I.V.R.I Barielly especially for how Homoeopathic medicine treats the animal . At I.V.R.I Barielly, Dr. Taruna Khemani wrote a complete Thesis over it. In healthy lactating animal,the immunity of animal i.e. BoCD4+ :BoCD8+ is 0.9 & Inference is that in Mastitis, Immunity of the udder i.e. BoCD4+ : BoCD8+ falls from 0.9 to 0.78 then bacteria invade the udder and if Mastacure is prescribed 30-30 drops 3 times, immunity of the udder goes to 2.47 on 5th day and then it falls to 2.10 on the 10th day and this raised immunity treats the infection and thereby cures the animal from Mastitis and so inference is Hivet Homoeopathic Medicines treats by raising theimmunity to 3 times and this raised immunity treats the infection. Sir, then these reports were sent to National Mastitis Council America in 2004 and 2005 and there comparison of one Medicine was made with Sarabhai Group. For this report you can see page no. 247 in annual meeting proceedings in 2005, of www.nmconline.org. In 2006, International Journal of Cow Science, at Page No. 2( 1 )-40 to 44 of www.ijcs.coz.in. It is written that Mastacure is the Medicine which could save annual Loss due to Subclinical Mastitis to the Tune of Rs. 4369 crores. Our Product is Purchased by SARAS DAIRY AT DIFFERENT DAIRIES THROUGHOUT RAJASTHAN (Rajasthan Govt.) Since 2004. “Flow cytometry analysis of different T cell Markers in Mastitic buffalo milk before and after treatment with Homoeopathic Medicine Mastacure�? in which the inference is (“It appeared that the up regulation of BoCD4+ T cells on different days following MASTACURE treatment reported in the present study might be responsible for enhanced bacterial clearance from mammary gland as revealed by absence of bacteria in milk following treatment with MASTACURE�?.) For complete details pl. see the proceedings of the 8th World Buffalo Congress held in Italy at Caserta, in October 19-22, 2007.